Since they’ve been few and far between, I thought I’d start the year off with a remodel post. You know, just for fun. Green and gold wallpaper. Gold lantern light fixture. Gold edge mirror. Olive green shower tiles. Goldenrod floor tiles. Beige and blue swirled marble countertop. Weird green stained (originally gold) vanity hardware. On move in day, the hairspray, lipsticks, and knickknacks were all gone, but the sad bathroom remained. As dark and rough looking as the bathroom was, everything worked fine – the shower, the sink, the toilet, the tub. I couldn’t justify ripping everything out at this point. 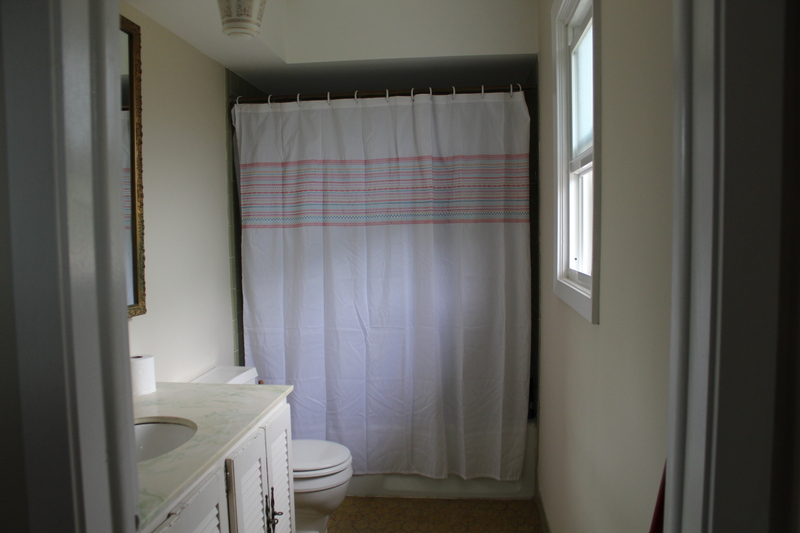 So, we removed all the wallpaper, painted the walls a light cream color, and hung a shower curtain (keeping the curtain closed as much as possible). It was blah, but it was an improvement. It stayed this boring during what I like to refer to as “Phase I.” Eventually, Phase I had to go. I was ready for, and needed, a change. It looks like a whole new room! I’ve read that with renovations, people re-do the less public places in their house (upstairs baths, bedrooms, offices) dead last. I would argue that especially for bedrooms and baths, they should be done first. I can’t tell you how nice it feels to go into that bathroom once we made the mostly-paint updates. It feels restful, even spa-like, which is exactly what I wanted. Though you can’t see it in the above photo, I found a chrome 3 light bath fixture from Pottery Barn on craigslist for $20. It isn’t available for sale now, so it’s likely a few seasons old, but who cares? Dan had no trouble swapping the lights out. Using just a coat of paint and some leftover knobs from another project, I was able to transform the shutter vanity. I looked around to get inspiration, and when I saw a grey shutter vanity at Home Depot for $900, I knew I could make something similar out of the one I had. I gathered some paint samples and ended up using Dark Granite by Behr (from Home Depot) for the vanity color. I decided a more neutral grey would work well for the walls. Using the same paint swatch to be sure the greys were in the same family, I picked the color Sparrow. It only took a quart for the vanity and a gallon for the walls. The vanity shutters were taken off, sanded, and painted on the basement floor, which was an extremely time-consuming process to avoid drips through the shutter slats. Then, using some leftover spray paint we had on hand, we painted the mirror frame in glossy white, which just looked cleaner in the space. 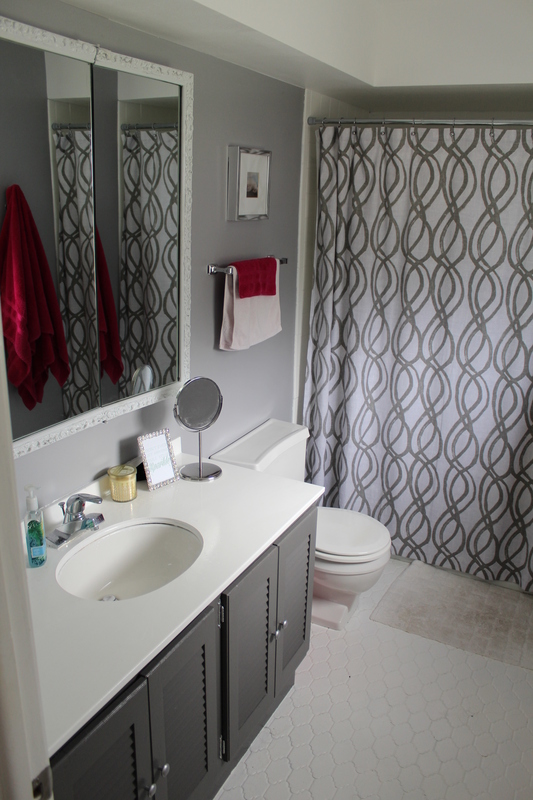 The hardest part of the bath’s cosmetic facelift were the tiles and countertop. I had heard you could paint tiles, so after some research, we bought Rust-O-Leum’s Tub and Tile Kit. Long story short, we hated the product, and I would not recommend it due to the painting procedure, smell, and lack of coverage as detailed on the package, but I do like the way the tiles and countertop look now. I like that the lantern shape of the tiles is still visible, which plays into the shower curtain pattern. The countertop looks great in a kind of shiny white, almost with the look of a solid quartz. The jury’s still out on durability, as it just hasn’t been long enough to see if the paint will hold up over time. The final pieces I added to the space were the artwork and accessories. The frame was a clearance find at Homegoods for $5 and the image is Lake Michigan on a particularly wavy day, clipped from Chicago magazine I had. I “shopped my house” and found a frame, candle, and countertop mirror that I thought would look nice in this mini-makeover. 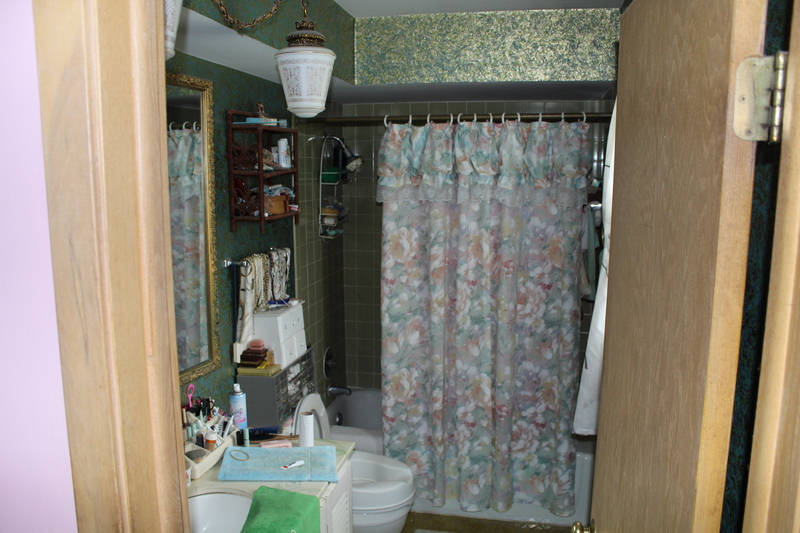 Once all the paint dried and I stepped back from the project, I looked around and realized this terribly ugly and dated bathroom was now one of my favorite spaces in the house. Never underestimate the power of a new coat (or two, or three) of paint. I’d say the improvement was completely worth it. Even though we know a complete remodel will eventually happen (“Phase III,” of course) and will include the tiles, tub, vanity, and mirror being demolished and replaced, Phase II doesn’t feel like an in-between phase, like Phase I did. I’m perfectly happy to keep the bathroom the way it is now for years to come.